November 17th – recovery day and a slow recovery at that when you are a peg off a half century. I had a most enjoyable birthday with the day entailing lunch at The Stomping Ground, Singapore newest wine bar, with two of the greatest pinot noir legends in America, Jim Clendenon from Au Bon Climat and David Graves from Saintsbury. What better way for a pinot noir obsessed palate to spend a birthday, immersed in profound pinot noir and highly stimulating (witty) compotation with these two veteran vignerons. We were also joined by James Hall from Patz & Hall, and Ray representing Drew Family wines, both excellent pinot makers although outclassed in the charisma stakes by Clendenon and Graves. It was also great to meet Jordon Mackay, wine and spirits writer for San Francisco magazine and author of “Passion for Pinot Noir” and “Secrets of the Sommeliers”. Had a good chat with Jordon, who seems like a really decent guy and certainly has the right wine mojo. It became obvious that we shared common views, particularly on the subject of wine scoring, where we both agreed ego-centric wine hegemony ratings systems are flawed and wine commentating losing its perspective in engaging consumers and enthusiasts on the more stimulating, intriguingly complex, tangibly palpable aspects of wine. 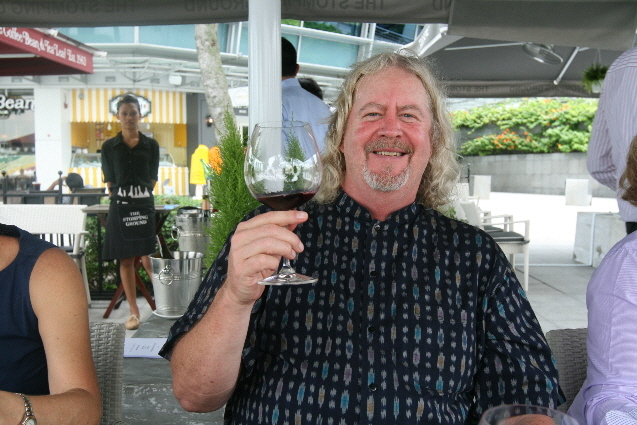 Sitting outside on a very hot and humid day in Singapore however, is not the ideal environment for tasting wine, moreover red wine, and I’m afraid I did not do justice to the wines. Even when we moved inside, the temperature was still not conducive to assessing in a serious way, although in reality my head was not in tasting mode; however it did completely enjoy the company and conversation with these winemakers. Picking up on a comment from Big Jim, who was in vintage form, “there is only one way to assess a wine and that’s to enjoy the whole bottle, with someone you can talk about it, with food.’. I shared with Mackay my philosophy on wines that I write up, with the knowledge that it lacks any commerciality or feasibility to be comprehensive; that I write almost all my review-tasting notes at the dinner table and will invariably revisit the wine several times over a month, thanks to winesave. It’s not about quantity, but quality and inspiring thirst and discovery. Birthday dinner was very low key, with a small group of close drinking buddies coming around for dinner at my place. I organised some of the brilliant Truffle Dumplings from Din Tai Fung for starters. http://www.thewanderingpalate.com/restaurants/best-steamed-buns-aka-dumplings-in-the-world-truffle-dumplings-at-din-tai-fung-%e2%80%93-singapore/ For main course, a leg of Maori Lakes lamb http://www.anzcofoods.com/our-products/lamb superbly roasted by Richard, our pro Chef. Yes, all very predictably kiwi! 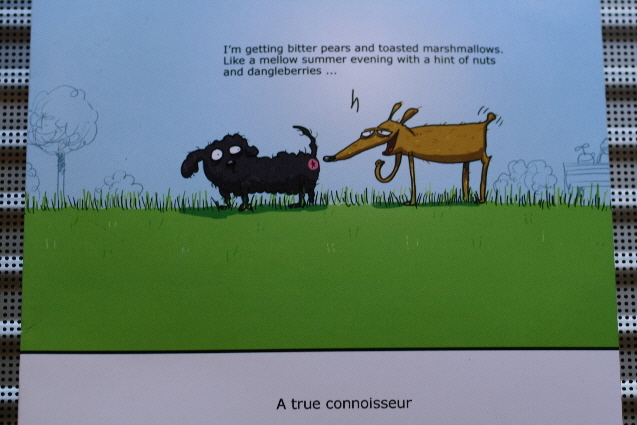 So, a big thank you for all the birthday wishes online and cards, to which I would like to share on that is priceless, excellent humour thanks Jeremy. And what did I get for my birthday… well I went out and bought a second fridge! It has been driving us crazy for years – not having enough fridge space, and particularly when entertaining. Try getting 3 whole Chinese roasted ducks in the fridge when it’s already full with the day to day necessities. But this is no ordinary fridge; it’s a completely ordinary fridge. Having visited several designer kitchen and appliance showrooms, I was totally bemused by the over-design and dysfunctional space of these brand-glamorous and extortionately priced appliances. Invariably there are way too many trays, bins, draws and gadgets and even the biggest of double door fridges, cramped and unworkable, and you can’t see what’s in the fridge. So, after consulting a few chef and restaurateur friends, I tracked down the professional refrigerator firm of choice, and purchased a stock standard drinks fridge that has a perfect range of between 2 and 4 degrees Celsius. 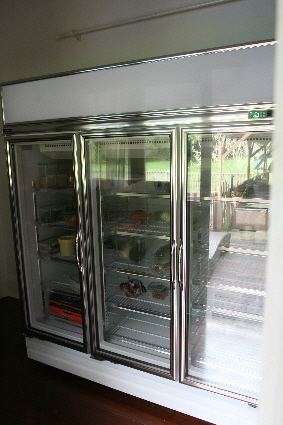 We’re not going to store the fresh or chicken in this one, but it’s absolutely perfect for everything else and when you live in a tropical climate like Singapore, everything that you would store in a pantry really needs to be in a fridge or continuously air-conditioned space. I also have something in the order of 20 or 30 wines open at any given time, and they need to be standing up, and kept cool for the winesave to work effectively, so it’s ideal for this. So, we are now on the slippery slope to a half century, and already scheming of going AWOL in the Rhone Valley around November next year. 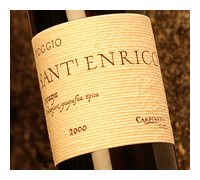 Life is filling in time bewteen meals… and a meal without wine could only be breakfast… Carp Diem! The Wnadering Palates New Fridge - You Got to get Yourselves One of These!